Now that I’ve gotten that out of the way, let’s address the elephant in the room—Evangelion: 3.0 You Can (Not) Redo, the third installment in the four-film remake of Neon Genesis Evangelion, is a difficult film. It’s difficult on the level of Stanley Kubrick, Andrei Tarkovsky or Rainer Werner Fassbinder. Whether this is a good thing is entirely up to how much effort you wish to put into your viewing experience. For some, the characters’ intricate relationships and the series’ unforgiving mythology will yield hours of speculation and theorizing. For others, this is incomprehensible self-indulgence on the part of anime auteur, Hideaki Anno. For those unfamiliar with the series, Evangelion is a hard science fiction story revolving around a young man, Shinji Ikari, and his attempts to fight off—using an enormous robot called an EVA—monsters called Angels that threaten Earth with a cataclysmic extinction event. Characters to know for this film are Gendo Ikari, Shinji’s father and the head of the shadowy organization responsible for facilitating the giant robots, NERV; Asuka Langley, pilot of EVA Unit 02 (the red one) and fan-favorite; Rei Ayanami, pilot of EVA Unit 00 and also the most introverted supporting cast member (for the sake of simplicity, we won’t delve much further); Misato Katsurugi, Shinji’s former exuberant caretaker; and Kaworu Nagisa, another EVA pilot and close confidant to Shinji. Fans of the series are also generally familiar with its heavy religious iconography and its esoteric psychoanalytic themes. Also, if any of this sounds familiar, it’s probably because much of the basic plot was lifted wholesale for 2013’s Pacific Rim. As for me, whose job it is to provide you with a halfway comprehensible review, I rather enjoyed this film. However, I’ll be the first to admit that it’s been over three years since I saw the previous film, and it’s been almost ten years since I saw the original series; as a result, my recollection is a little hazy on which events belong to which version of the story. (To give an example, I’ve seen three versions of Evangelion’s first episode—one as a part of the series and two as film versions.) But like most high-concept art, I find it’s best if you just let everything wash over you. Stop trying to make sense of things. The connections will start to become implicit. What follows is my best attempt to describe what is actually happening in this film. If you give up on this paragraph and skip to the next, I understand. But here’s the story thus far: fourteen years after the events of Evangelion: 2.0 You Can (Not) Advance, Shinji, who nearly brought about the aforementioned extinction event in an attempt to save Rei’s life, is found floating in space by Mari and Asuka, who barely managed to survive being attacked by Shinji’s EVA unit the last time they met. Once Shinji awakens, he finds his former caretakers Misato Katsuragi and Ritsuko Akagi have become cold to him and treat him as a prisoner. This is explained when the base—which is pretty much a cross between an EVA and an airship—is suddenly attacked by Unit 00, which belongs to Rei Ayanami. It’s here that we learn that Misato and Ritsuko have split off from NERV and formed their own resistance group—WILLE—with the goal of destroying all of NERV’s EVAs. As it turns out, Shinji has wiped out most of Neo-Tokyo, and when Rei brings him to the ruins of the NERV headquarters he’s instructed to pilot another EVA unit along with another pilot, Kaworu Nagisa, in an attempt to stop another extinction event. Trust me, this is nowhere near where things start to go off the rails. Despite the convoluted details of the story, I do believe this is a film worth watching. If you come to accept Evangelion: 3.0 as hard science fiction, you’ll find that most of the jargon can probably be ignored. Pay attention to the characters and you should be able to keep up with the basic plot. What I found engaging through most of this film is the way Shinji’s guilt is externalized in the postapocalyptic landscapes. Often, Shinji is a small figure against rusted pillars and empty rooms. We’re made to feel his loneliness and his regret for alienating everyone closest to him. Remember, this a boy who almost singlehandedly ended the world. That’s a pretty great weight to carry. 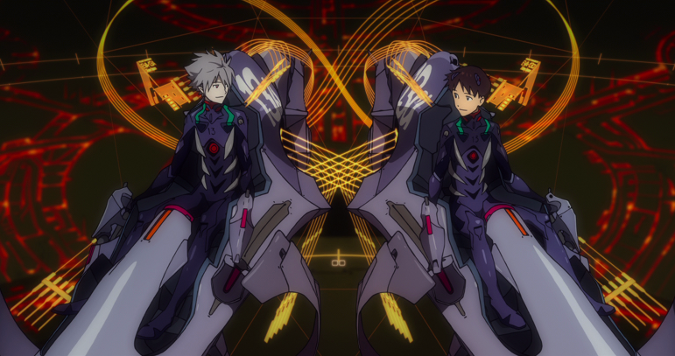 I also enjoyed the way the directors chose to visualize his relationship with Kaworu. And in a movie where characters are defined by their relationships, it’s telling that this is the only positive male-male relationship in the film. There’s a beautiful scene in which Shinji and Kaworu practice duets on the piano. It’s a way of showing these two are compatible in a subtle and meaningful way to the viewer. The animation is also excellent although I felt it would have benefited from being watched on a smaller screen (I attended a limited release at my local theater). It was sometimes hard to determine what was happening in a fight simply because there’s so much lavish detail on the scene. However, there are always clear stakes and motivations in the fights, which is a nice treat as I’m finding that’s becoming rarer and rarer. As for the film’s music, I hate to call Sagisu’s score bombastic or even overbearing because even though it’s filled with choral arrangements, piano staccatos, and dirges, it all fits very nicely with the film’s operatic structure. This film is the third movement of four, and I can think of no better score than what’s presented. The film should sound like a mass, and it certainly accomplishes that. Again, even though I believe this is a difficult film, I wouldn’t call it an unrewarding film. I feel that film, unlike many written mediums has license to evoke moods and emotions without having to be concrete about it. 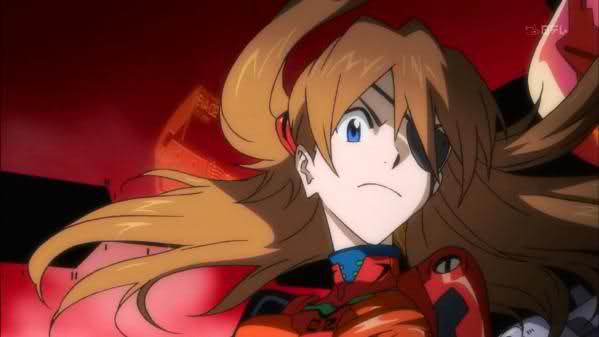 If you have the patience and wish to experience a truly singular animation experience, then I’d say give Evangelion 3.0 a shot. Just be prepared to have some questions when the credits roll. This entry was posted in 2.0 You Can (Not) Advance, 3.0 You Can (Not) Redo, Andrei Tarkovsky, angels, anime, Asuka Langley, Comic Book, EVA, Evangelion, Gendo Ikari, Hideaki Anno, Kaworu Nagisa, Kazuya Tsurumaki, kenneth kimbrough, Mahiro Maeda, Masayuki, Misato Katsurugi, Movie Reviews, Neo-Tokyo, Neon Genesis Evangelion, NERV, Pacific Rim, postapocalyptic, Rainer Werner Fassbinder, Rei Ayanami, religious iconography, Ritsuko Akagi, Shinji Ikari, Shiro Sagisu, Stanley Kubrick, Studio Khara, Toru Fukushi, WILLE, Young Mi Lee and tagged 2.0 You Can (Not) Advance, 3.0 You Can (Not) Redo, Andrei Tarkovsky, angels, anime, Asuka Langley, EVA, Evangelion, Gendo Ikari, Hideaki Anno, Kaworu Nagisa, Kazuya Tsurumaki, kenneth kimbrough, Mahiro Maeda, Masayuki, Misato Katsurugi, movie reviews, Neo-Tokyo, Neon Genesis Evangelion, NERV, Pacific Rim, postapocalyptic, Rainer Werner Fassbinder, Rei Ayanami, religious iconography, Ritsuko Akagi, Shinji Ikari, Shiro Sagisu, Stanley Kubrick, Studio Khara, Toru Fukushi, WILLE, Young Mi Lee. Bookmark the permalink. I thought the film was pretty terrible. It’s easy to interpret the meaning behind it though: When you choose to live in anime dreamworlds with waifu’s like Rei, you’ll alienate yourself from everybody else and they’ll move on without you. That’s what I thought the scorn everyone has for Shinji is about. The people who’ve changed and grown without you and now look down on you with disgust. The unanswered questions and really convoluted plot aren’t really what bothered me with the film. What frustrated me was how one-sided it was against Shinji. It made me look back on ‘End of Evangelion’ and realize how Anti-Shinji and Pro-Gendo the director really is. This film has killed my hype for the Rebuild Final, and fatally wounded my status as an Evangelion Fan. The film was beautifully animated, but to me it was like watching crap in Hi-Def.